WASHINGTON (CNN) -- In a blunt assessment of race relations in the United States, Attorney General Eric Holder Wednesday called the American people "essentially a nation of cowards" in failing to openly discuss the issue of race. Eric Holder spoke to an overflowing crowd for Black History Month at the Justice Department Wednesday. In his first major speech since being confirmed, the nation's first black attorney general told an overflow crowd celebrating Black History Month at the Justice Department the nation remains "voluntarily socially segregated." "Though this nation has proudly thought of itself as an ethnic melting pot, in things racial we have always been and continue to be, in too many ways, essentially a nation of cowards," Holder declared. Holder urged Americans of all races to use Black History Month as a time to have a forthright national conversation between blacks and whites to discuss aspects of race which are ignored because they are uncomfortable. "On Saturdays and Sundays, America in the year 2009 does not, in some ways, differ significantly from the country that existed some 50 years ago. This is truly sad," Holder said. Following his address, Holder declined to say whether his unexpectedly stern message would be translated into policy. "It's a question of being honest with ourselves and racial issues that divide us," Holder told reporters in a hastily arranged news conference. "It's not easy to talk about it. We have to have the guts to be honest with each other, accept criticism, accept new proposals." The nation's top law enforcement official vowed to "revitalize the Civil Rights Division" at the Justice Department but offered no specifics. The attorney general criticized past public debates on the issue as "too often simplistic and left to those on the extremes who are not hesitant to use these issues to advance nothing more than their own narrow self-interest." Allegations of politically motivated hiring in the division and increased emphasis on combating religious discrimination and human trafficking -- rather than concentration on traditional civil rights enforcement -- during the Bush administration caused some dissent in the department. 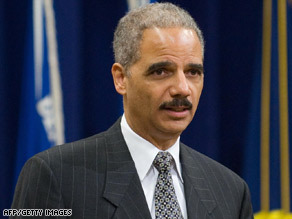 Holder has promised to bring order to the Civil Rights Division.